Bob Cockriel retired in late August from his position as the City of Bloomington Utilities Superintendent. 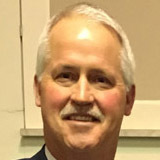 Bob served as the APWA-MN Chapter President during 2015. Bob was also a long-time chair of the APWA-MN Chapter Conference Planning Committee. I recently had a chance to visit with Bob about his career. What prompted you to pursue a career in public works? I was destined to be a public servant. My father worked for the City of St. Paul for over 35 years, first as a member of their pollution control and monitoring group, and then as a License Inspector. I had a grandfather who was a career IRS Agent, and the other was an officer in the military, retiring after more than 30 years of service to our country. After my grandfather retired from the military, he was appointed as Chief of Police for the Minnesota State Fair. The tradition of public service continues in my family. My daughter worked in the Communications Department for the City of Bloomington before taking a similar position for the Town of Flower Mound, Texas. My son-in-law is a police officer for the City of Blaine. I am proud of my family’s commitment to public service! You have been involved in numerous public works improvements. What project are you most proud of and why? The project that stands out for me the most was the expansion of Bloomington’s lime softening water plant and wellfield. Along with the Bloomington Utility staff, I was involved in every aspect and phase of this project, from concept development to commissioning. This exciting project came in on time and under budget and was selected as the APWA’s 2002 Environmental Award winner for projects over $10 million. This was an incredible opportunity for the city and its staff to be part of a legacy infrastructure improvement project that will serve Bloomington for 50-100 years. You have had a chance to work with some incredible public works and local government leaders. Who would you suggest most greatly influenced your career and how? There are two people I feel that were the most influential and instrumental in helping me build my public works career, and both are long-time APWA MN-Chapter leaders: Steve Gatlin and Charlie Honchell. In the late 1970s, Steve saw something in me, took a chance, and mentored me over the course of time as we worked together in White Bear Lake and later at the City of Roseville. Steve helped guide me toward advancing my education and broadening my perspectives through additional education and involvement in professional organizations like APWA. Without Steve, I would not have had the career successes that I have had. The second person who took a big chance on me and really supported my career development and advancement was Charlie Honchell. Charlie was a very experienced and accomplished professional when we first met. Charlie selected me to replace Bloomington’s first-ever Utility Superintendent who had retired in 1993, and I had big shoes to fill! Charlie and I worked together for about 13 years and we made great strides in moving the Bloomington Utilities Division forward. I still remember many of the work/life-lessons that Charlie shared with me along the way that I still draw from today. A big Thank You to both Steve and Charlie for all you did for me! You have served this chapter as a member of the Conference Planning Committee and as the President of the Chapter. What have you gained from being an active member of the Minnesota Chapter of APWA? As an active member, I feel that I have the right to say that I had a hand in improving our chapter and the public works industry. I have met many other like-minded public works members who also wanted to make a difference and contribute to the Chapter and the profession. It was at times hard work, and other times very fun and rewarding. Get involved, volunteer your time and talent, and in return, you will get personal satisfaction, meet new friends and colleagues. Your involvement may even lead to your next job! As a leader in the water industry, what do you see is on the horizon for those who are charged with the responsibility of providing clean, safe drinking water? We live in a time of constant finger-pointing and blaming others for the problems that may or may not be real. I think one of the biggest challenges will be for public works professionals to keep elected officials and the public informed on the issues and concerns that are encountered when designing and operating local water systems. Public works professionals will need to continue to lead education efforts on water-related topics, including availability, consumption patterns, wise water use (conservation) efforts, and upcoming regulatory changes. Water professionals need to continue to be engaged in forming a realistic water picture for today and in the future. We will then be better positioned to craft a state-wide response, with input from all involved and affected parties, to address whatever challenges require our attention. What words of wisdom would you like to share with someone who is new to APWA or to the profession? Step up and get involved in APWA or other professional organizations. I have belonged to several industry organizations, but I must say that I have had the best experiences, both personally and professionally, as an active member of the MN Chapter of APWA. Bob, congratulations again on your successful career and your retirement. I look forward to seeing you and other Past Presidents at the Fall Conference!